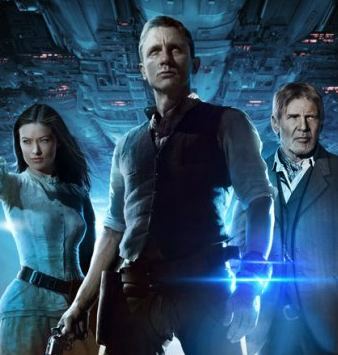 Article first published as Movie Review: Cowboys & Aliens on Blogcritics. Mixing movies has been a hit and miss in the movie industry. Some combinations have worked out quite well and others not so well. Now we have a fresh new idea of genre mixing that looks like it could be a sure fire winner, even if the outcome seems one-sided. Take a Western, a gritty genre of cowboys battling at high-noon, robbing trains and chasing Indians across the wide open plains of the west and mix it with other-world visitors bent on our destruction. What you get may very well seem like a one-sided battle, considering modern day settings of plotting human V.S. alien puts us in a bad situation. Sure, we almost always win but we’re given a stern beating in the process. I know how to fix it. You give the protagonist a weapon that belongs to the aliens, capable of destroying their vessels in a single shot! Welcome to Cowboys & Aliens. The latest attempt at alien invasion, based on a graphic novel of the same name, stars Daniel Craig (Casino Royale, The Golden Compass) as Jake Lonegren, a man with no memory of who he is, or where. The movie begins with Jake awakening in the desert, confused as to his whereabouts. Within moments, he’s met with a group of unsightly men, whom he quickly dispatches. It is from this moment we understand that Jake does indeed know how to defend himself. He staggers his way into a small Arizona town by the name of Absolution, controlled by the ruthless Colonel Woodrow Dolarhyde, played by Harrison Ford (Indiana Jones, Air Force One). Jake soon meets a spineless bartender by the name of Doc, portrayed by Sam Rockwell (Iron-Man 2, The Green Mile) and a mysterious woman, Ella, played by Olivia Wilde (TRON, House). For the first portion of the movie, it plays out like a western. We have dirty, gritty men, horses, small town and a tyrant who controls it. Let’s take a little dash of extraterrestrial and toss it into the mix and you end up with a fairly decent movie. It doesn’t take long for the aliens to begin their assaults on the denizens of Absolution, and we soon learn people are being abducted. From here we go on a chase to save those abducted and bring peace to the old west. The movie is a joy ride through a new genre with a lot of potential. Sadly some of the potential is missed. Some elements of the story I felt could have used a little more explanation to help immerse the audience even deeper. I’m one to rarely complain about story in a blockbuster movie, considering most are intended to be watched for enjoyment. But I could not shake the feeling that at the end, something was missing. What was missing though? I’m not completely sure, as the movie itself is pretty complete and satisfying. Plenty of action, plenty of explosions and enough entertainment value for me to see it again and again, yet something was missed. Perhaps the graphic novel could hold the key to what is missing. I just felt the aliens didn’t get quite enough explanation behind them and their true purpose here. The ending was also a negative highlight for me. It felt wrong. The ending felt like it was one of many potential endings and it wasn’t the right one for this film. Granted, most westerns end with cowboys riding off into the sunset, and that wasn’t what this movie needed to end with. For me, the ending was a bit too serene considering what transpires at the end of the film. This goes right back to the reasoning of the aliens being here, it felt like a bit more explanation of their purpose was missed that could have been answered in a small scene. Though I must admit, I didn’t wait till the end of the credits so perhaps Favreau had a scene there I missed that I can catch up with on the blu-ray. One of the biggest highlights for me in this movie is the Indians. Not only does Favreau do a splendid job portraying them, they play a very important role. Most movies will make a play on the abilities of a medicine man to heal the hero, or someone he loves, and then they are on their way. Favreau makes them a very important part of the story. I was pleased to see so many Native Amercians in the movie with very prominent and important roles to the story. Beyond these small, minor details, I found the movie to be more than pleasing. The movie is an exciting trip through the wild-west while being chased by aliens. Favreau continues to please with his movies and understands what an audience wants. He brings us excitement and adventure yet leaves enough room for our imagination to run while watching a great action flick. It’s an exciting adventure with cowboys, Indians, and for a fresh change of pace, aliens!